Wonder by Hillsong UNITED Is Now Available! 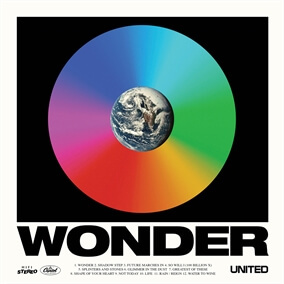 Multi-award winning, platinum-selling worship band Hillsong UNITED's 6th studio album, Wonder, is now available worldwide and with it, the band hopes to re-awaken the innate sense of Wonder within the human being. Front man Joel Houston poses the question, “Have we lost the Wonder?” He goes on to explain, “The hope, the imagination to dream, to believe, the tenderness to listen and lead first with mercy, the grace to empathize, the courage to trust, the fearlessness to love without pretense or condition. To see beyond the facts without dismissing them. To respond beyond the fear without reciprocating it. To sing beyond the noise, without adding to it. This is the challenge, and this is what worship— if worship can be summed up as an expression of art and music and story— is ultimately designed to do. To elevate the conversation, re-awaken the soul to something other, and lift our eyes to the wonder of a superlative truth." Wonder is an incredible new album that explores themes of God's goodness and love and it mixes together thoughtful lyrics with rich vocals and instrumentation. Having previously released the MultiTracks for the album's four instant grat tracks, "Wonder," "Splinters and Stones," "Shadow Step," and "Shape of Your Heart," we are excited to bring you the rest of the songs from the album today, including "Glimmer in the Dust," "So Will I (100 Billion X)," and "Not Today." Check out the entire album, which is now available wherever music is sold.